It was submitted on the 11.14.16. Abstract and listed of letter writers will be posted. Committee Reports. Debbie, Pam and Julie met via conference call Nov. 7. Discussed individual committee work/focuses and building efficiencies across the three committees. Focusing on project with will have a quick output and inform future work. Community Report (Pam reported). Have meet, discussed lit review. Met with economic and environment committees to talk about dividing literature reviews; since there is overlap, Debbie said she needs to check with Charlie Hall’s grad student to see when her work will be done and let Pam know. They meet monthly, first Monday at 2:00 to accommodate all members. Environmental Report (Julie reported). Committee has met and they are looking at goals, reviewing the literature and searching out one or two things to focus on. Planning lit review to support priority project. Marketing Committee is officially recognized. We not have four committees and three councils. Councils are in the process of gathering members. Short term goal of Economic Committee: Seeking a method to present information about the significance of Consumer Hort to internal and external stake holders. Proposed creation of an info graphic. Reasoning: This is an opportunity to present us so that those that are in positions of power in influence can see how important we are they will want to support us. Clint asked: Why are we left out, overlooked? Answer: Historical reasons. Not on the radar screen. Just don’t think of the plant side till the very end. Only interface with plant material through a contractor (third party). Who will help? Pro-bono graphics work. Suzi may be able to do something very simple. We need graphic expertise to really do it well. Tom U. may have the talent in the organization. Suzi outline the benefits of one number. Can this all be boiled down into one number? Jobs, tourism, production, health all in one number? Maybe. Maybe someone can donate the skill for the info graphic. Also need help to vet the graphic and get buy in. Clint suggested pitching this as story for the trade press, help industry – how the graphic was created. Communication committee can take this the magazines. If the magazines write the story, it will be stronger than a press release. Graphic must be Pragmatic and Centrist. Opportunity to present this info to garden center meeting in January – Clint will lead. Very good support for this project from the committee. General consensus is “GO, GO, GO, GO! 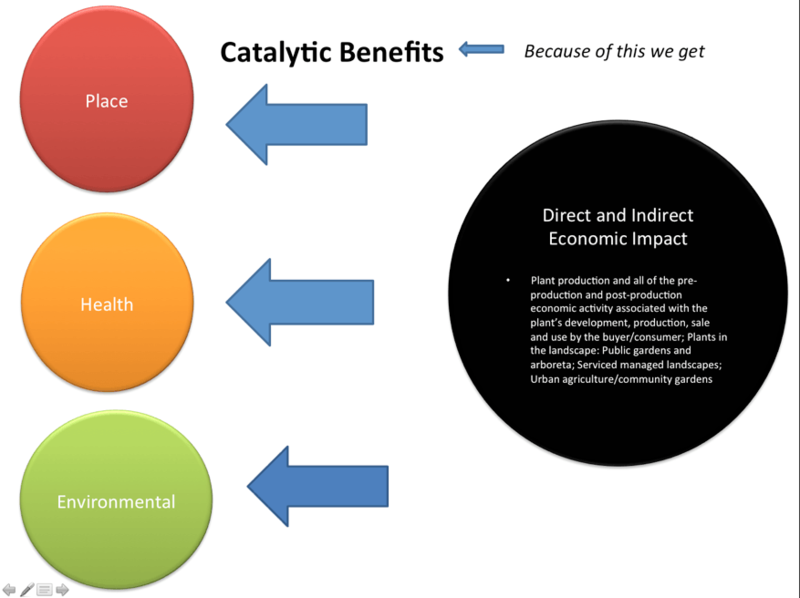 Example: CH catalyzes benefits back to Place – improved landscape, more expensive property, improved tax basis, creative people want to live there. Update on-pager. Get committee on it. Rick and Margaret are co-chairs fix that. Add Marketing Committee to that section. Suzi is the chair. Update Councils.